As you might imagine, Jax and I have pretty cool friends. 😉 Some of our cool friends are doing wonderful charitable works in our community. Since part of being a Pagan Princess is being (a Pagan) part of your wider community, we wanted to spotlight our friends’ wonderfulness. This is the first in a series of spotlights on charitable works (and our cool friends). My friend Najla is a belly dancer and belly dance instructor extraodinaire who is dedicated to giving back to her community. * Even when she is not actively helping a charity, she is creating opportunities for other artists to grow. ** Recently, Najla partnered with another local belly dance darling, Bahaia, to (re)launch the Aria Dance Foundation, a foundation dedicated to promoting a positive (and accurate) image of belly dance and of belly dancers. *** [Jax and I can relate to that mission statement!] Bahaia has been teaching belly dance, hosting events, and bringing nationally recognized dancers to Austin to teach seminars for many years. Together, Najla and Bahaia came up with an idea for the Aria Dance Foundation to engage in charitable works through their Glitter Gives Back campaign. The first event for Glitter Gives Back (GGB) is well underway — the foundation is accepting donations for care packages that will be delivered to Hill Country Cares, a woman’s shelter dedicated to assisting families in need. Najla chatted with me about how Glitter Gives Back came into being and how their first campaign is developing. I know from conversations with you that Glitter Gives Back emerged from planning discussions with Bahaia regarding the Aria Dance Foundation. Can you tell me more about how that happened? Did you or she already know you wanted to do charitable works? When we talked about reactivating the Aria Dance Foundation this past year, we didn’t really have any long term, specific goals in place although we did want to use the foundation as a way to help create a strong sense of community among dancers. I had mentioned at one time that I wished I could afford to attend Camp Mighty which was created by a blogger that I’ve followed for years. What I loved about the ads for the camp was the sense of play, opportunities for networking and learning, along with a community service project. Bahaia asked me one day (perhaps on a whim) if I would like to do something similar at Cabaret Belly Dance Camp in October. She actually came up with the name “Glitter Gives Back” while we were eating lunch and our plans began! We’re starting with a project that coincides with belly dance camp, but we really want Aria Dance to play a more active role in helping dancers (and women) in our community. What inspired you (and Bahaia) to want to do charitable works? Belly dancing has given me so many wonderful opportunities, friends, and memories over the years, and I think women everywhere should share in some part of this experience. When I started teaching some Mother-Daughter workshops over a year ago it wasn’t so much about teaching a dance form but rather teaching women (regardless of age) to appreciate their own bodies and their own beauty. I personally believe strongly in giving to others whether it is money, time, or just emotional support. Bahaia actually inspired me to give mini-scholarships to students who may not be able to afford classes and to think beyond just teaching and performing. So I think it was a nice marriage of our desire to give back to the community and coming up with some fun projects to help meet those goals. Inherent in the name, GGB is about belly dancers giving back to the community. This is your inaugural event. Have you been pleased with the response so far? Has the response been what you expected? Everyone who has heard about the project has been excited about participating. This is the first event of this type that I’ve organized, and I’m learning as I go along. The response initially was great verbally but slow in terms of actual donations. However, as I’ve worked through sending emails and information I’ve learned that people really want to help out but they need to know how. After I sent out more specific (and hopefully clearer) instructions, the response has really picked up, and I really do think we’ll meet our goals by the time we hit the hill country [dance camp]! How did you select the recipient organization (Hill Country Cares)? What drew you and Bahaia to support women victims of domestic violence? We knew that we wanted to do something to help women, and since we have campers coming from all over Texas (and beyond) to belly dance camp I thought it would be fitting to find a charity close to where we literally will set up camp (okay, they are actually cabins…but you get the idea). I also wanted something close to home and somewhere that had a tangible need we could fill. Hill Country Cares was a great choice for me because of the multitude of services they offered, not only for women but also for families, and that they provide services for five counties in Central Texas. I chose a goal of 50 bags for women and 15 bags for kids to mirror the total number of campers, staff and instructors that will be attending. I’m also hoping this will provide them with supplies to make it through a large part of the year. What kinds of donations do you still need? Cash is a good choice to help fill in the gaps for the products we don’t get donations for. However, we are still needing a lot of the basic hygiene products for women. For example: full-size shampoo and conditioner, brushes and combs, razors, soaps, etc. Where can people drop off material donations? Where can they make a cash donation? 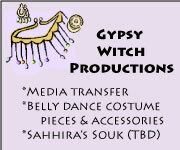 They can drop off material donations at Tarrytown Dance tonight (September 30, 2011) from 7:00-10:00pm. We’re having a party and crafting event for GGB there tonight! Or at Café Shimmy tomorrow night (October 1, 2011) from 6:00-9:00pm at Hot Mama’s Cafe. If someone wants to donate but can’t make either of those events, they can drop me a note at najladances@gmail.com and I’ll be happy to come pick items up (here in Austin). Cash donations can be made online (and are tax deductible) on the Aria Dance page on my blog. Thank you, Najla, for sharing your story with us! We hope The Realm will support Glitter Gives Back. And we wish Aria Dance Foundation much success. What about you Royal Readers? Do you engage in charitable works? Or do you know of a foundation that deserves a “Hear ye!” If yes, please tell us about the charity in the comments! ** Najla occasionally hosts workshops on the Artist’s Way. And she produces a local belly dance venue called Café Shimmy, which is every first Saturday of the month at Hot Mama’s Cafe on E. 6th Street, Austin, TX. You can usually see me dancing at Café Shimmy with Najla and our fabulous webmistress, PixelPiper! *** Bahaia is a Middle Eastern word that means “very beautiful.” Bahaia’s given name is Betsi Robins. + Featured image is the GGB logo created by Claire Stone. Thank you darling for the lovely post!